University Place, Washingtonis a small city just south of Tacoma, home to a wide variety of commercial and residential neighborhoods. The community is distinct from Tacoma, with streets laid out in scenic, winding patterns, and dozens of small city parks and undeveloped green spaces. 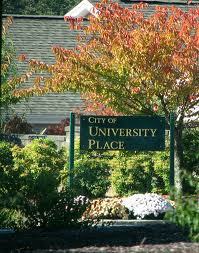 University Place also includes a long Puget Sound waterfront lined by beautiful homes, many dating back several decades. The University Place real estate area was intended to be a University of Puget Sound campus, but was sold to the city of Tacoma in the late 1880s, and slowly developed into a quiet residential community instead. Today the independent city is one of greater Tacoma’s most affluent areas, and includes a wide variety of upscale homes and condos in many 20th century styles. Top end University Place home listings are typically priced near the $1 million mark, and come with luxury amenities like waterfront view rooms, custom landscaping, and vaulted ceilings. University Place Washington real estate varies widely, running the gamut from smaller condos to Larger homes, Everything in between can be found as well. Our website: PiercePowerSearch can aid a buyer in locating just the type of home they are seeking in University Place and the surrounding Pierce county area. Whether seeking an investment property, new home , or a second home all of the listed real estate in Pierce county can be found here including University Place Washington real estate. One of the exciting tools on the site is the easy to use MAP. Buyers can go to a specific area in the University Place Washington real estate market and see all the current condos and homes for sale in that area, especially useful for those seeking University Place Washington real estate near the workplace or other important locale. Aside from location, property type and size is, of course, a major factor when buying a home. The University Place real estate market has a wide variety of property types. Our search tool allows buyers to zero in on the kind of property that meets their needs. Users can quickly sort by multiple criteria such as location, square footage, number of bedrooms, lot size, etc. Whether you are an investor, family, or a relocating young professional our site can help you find what you need in the University Place Washington real estate market. We also have all listings for the entirety of Western Washington as well! Price is always an important factor and there are a wide range of prices throughout the University Place Washington real estate market. Our search engine allows buyers to search specific prices or enter a wide range from minimum to maximum price. For buyers with pre-approved loan amounts, this lets them concentrate their search real estate they can afford. Many people also want to buy in certain community types and PiercePowerSearch has the tools for that kind of search too. Users can search all the available properties in golf communities as well as the listings in gated communities for example. If mountain view and water front locations are important, users can search University Place real estate with those criteria as well. When ready to view or purchase, users of this site can schedule a visit almost as simply as clicking the mouse. One of our University Place real estate professionals will return contact immediately! Our site has information on financing as well as real estate and mortgage professionals. PiercePowerSearch is a great tool for buyers. It takes them from the initial property search in the University Place real estate market to closing on their dream home. This site is a powerful and accurate tool for anyone interested in University Place real estate and the University Place Washington home market.